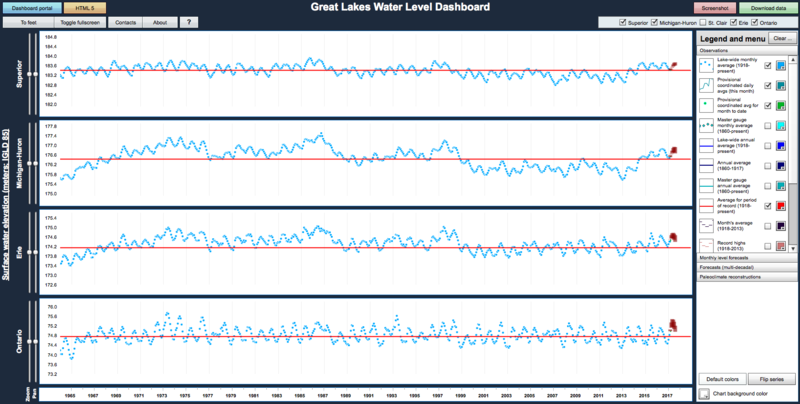 The Great Lakes Environmental Research Lab developed this online display to allow the public access to water level data. Predicting water levels in the Great Lakes is not as straightforward as it would seem. A warm winter has led to lower ice coverage–just 5 percent of the Great Lakes was covered with ice as of March 1. The average coverage at this time for the last 40 years has been 43 percent, according to the Great Lakes Environmental Research Laboratory in Ann Arbor, Michigan. But it’s not quite that simple. And not the case now. That’s because water levels are a function of many factors, Bruxer said. Last winter was also warm and with less ice, he said. But that didn’t result in below-average water levels either. Water levels in the Great Lakes are mostly driven by evaporation, precipitation and runoff, according to Drew Gronewold, a hydrologist with the Great Lakes Environmental Research Laboratory. Of the three, precipitation has the most influence. And there’s no correlation between ice cover and precipitation, Bruxer said. Gronewold and his colleagues use water gauging stations around the Great Lakes to monitor year-round, entering the data into an online display. Despite the scant ice cover, each of the lakes is slightly higher than average. But that’s not much of a story, according to Bruxer. “The notion that they’re high is vague and maybe not very accurate,” Bruxer said. Over the last three years, water levels have been higher in Lake Huron, Lake Michigan and Lake Superior than they had been in the last decade. But that last decade has been a period of low water for each. He’s not just referring to seasonal changes. Water levels can experience dramatic shifts over years. We can often get used to a certain level and forget to account for the possibility of changes, Gronewold said. People may be alarmed about higher waters because they had become used to lower levels over the last 10 years. Warm winters don’t appear to be wreaking havoc on water levels. The question then is whether the warming global climate will change that. Current climate change models predict more precipitation in the region because warmer air is able to collect more moisture, Gronewold said. But warmer air also means more evaporation, and scientists aren’t sure which factor will win out. The lakes follow a similar pattern each year, rising in the spring and falling in the autumn. What lake levels will be like this summer depends on the amount of rain in the spring, Bruxer said.